We don’t think anyone in our industry will dispute the fact that connectivity is here to stay. Passenger expectations are driving that demand, and airline operations are too. However, have any of you IFEC aficionados noticed that the rate of connectivity installations is slowing down? This may seem a bit surprising given all the hype over connectivity, point in fact, over the past five- or six-years connectivity has been the primary focus of every trade show this publication has attended: AIX, APEX, FTE, etc. Think about the buzz phrases: gate-to-gate, end-to-end passenger experience, the connected aircraft – they all focus on the use of connectivity to improve the airlines’ ability to touch the traveler throughout their journey and tailor their experience to meet expectations. So why the slow down? One factor we believe is that operators are grappling with decisions regarding Ka- vs. Ku-band. A connectivity decision is a costly venture and is typically a hardware commitment for their fleet for the next 7 – 10 years. The airlines are faced with sifting through all the pros and cons of each solution to determine which is the most viable and reliable option to fit their model. Now throw in the possibility of the LEOs and things became a lot more complicated. Also, antenna installations are not a penny a dozen – they are expensive and complex. Add to that the recent statements released by the FAA regarding antenna/radome installations and the Airworthiness Directive issued by EASA and airlines are likely to pause over making a quick decision. Given these issues, we also expect it to be more challenging for some connectivity suppliers to generate near-term investment capital. Needless to say, connectivity suppliers and hardware vendors have made a large commitment and there are many players in the field – maybe too many. As we mentioned in an earlier issue of IFExpress, we expect continued consolidation within our industry. Along those lines, we have heard that one of the majors in the IFE arena is making a play for the commercial division of a major connectivity company, as well as, the connectivity portion of second significant industry vendor – despite one or both of the potential acquisition companies having issues with significant debt. We are hearing DIP (debtor-in-possession) financing is being discussed. The company making the acquisition overtures evidently sees the potential is greater than the risk involved. And interestingly, they will also become a Ku-band operator, as well as, a GX Aviation (Ka-band) reseller. If the stars align, these acquisitions will launch them into the first-tier position in the Big Three – at least as far as connectivity is concerned. We live in interesting times. During APEX we had the opportunity to sit down with Nancy Walker, the new CCO, and Ryan Stone, president of SmartSky Networks, to discuss the status of their 4G LTE air-to-ground (ATG) connectivity service roll-out. Nancy joins SmartSky with 30+ years of experience in the aviation industry having worked for NASA, Harris, LiveTV and Thales. We were told that SmartSky is in the process of standing their ground towers, and at the time of the interview 77% of them were in the final stages of installation/completion. Currently, the company is focusing their ground-based installation activity on very specific channels: New York to Chicago and Chicago to Florida. The team said they are well on the way to launching their first business aviation customer and that they are in an active demonstration phase. Nancy told us that they have 1,000 of ours of flight test time logged on three different aircraft models and that they had just received their 96th patent! 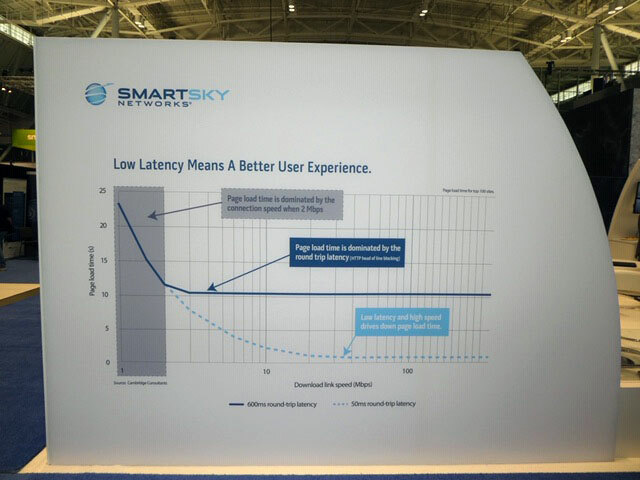 What SmartSky offers using their 2.4 GHz unlicensed spectrum and patented 4G LTE beamforming technology is a path to get data off the aircraft very quickly. In fact, they claim their high bandwidth capability off the aircraft is unique to their service offering. The SmartSky ‘pipe’ is designed to provide 4 GB/hour to the aircraft and 3 GB/hour off the aircraft. What this translates to is a low latency network that allows users to receive large attachments in their email, and easily stream video on their Wi-Fi enabled PEDs. Ryan Stone went on to say that SmartSky is using a highly patented technology that helps make the system more secure. Not only do they use encryption technology, but the system utilizes a very narrow and specific beam, requiring a low power level to transmit to the ground; therefore, security is innately enhanced. Since our interview in Boston, Penstastar Aviation developed an Approved Model List (AML) Supplemental Type Certificate (STC) that permits SmartSky installations on the Gulfstream GIV-X models and GV-SP as well, and the first customer installation has occurred in the business aviation market. The company is looking to enter the commercial realm but firmly believes that more general aviation operators will be utilizing the system before airlines enter the mix. It wouldn’t surprise us if a North American carrier were to add the SmartSky Network onto their aircraft in conjunction with an already installed connectivity system. After all, that is a current airline trend: multiple suppliers for connectivity. This is one to watch! The A330-800’s development program will include around 300 flight-test hours, paving the way for certification in 2019. Its sibling, the larger A330-900 family member, recently completed its development testing and certification program which validated the A330neo Family’s common engines, systems, cabin and flight & ground operations. 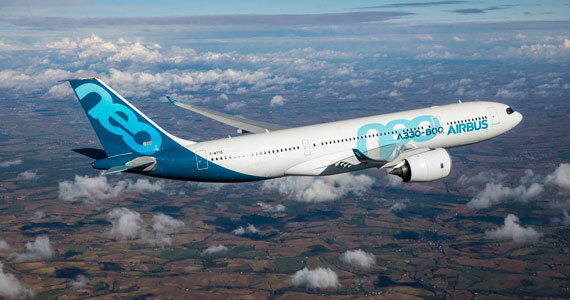 The A330neo comprises two versions: the A330-800 and A330-900. Both of these widebody aircraft incorporate new Rolls-Royce Trent 7000 engines, nacelle, titanium pylon, new wings and offer an exclusive ‘Airspace by Airbus’ passenger experience. The larger A330-900 will accommodate up to 287 seats in a typical three-class layout, while the A330-800 typically will seat 257 passengers in three classes. At the end of September 2018, Airbus’ order book includes 13 customers who have placed orders for a total of 224 A330neos, with more to be added soon. Airbus will fly an airBaltic A220-300 new generation single aisle aircraft, to five cities in four countries as part of a world demonstration tour. The A220 demonstration tour is a great opportunity for Airbus to showcase its newest family member in front of airlines and media and to offer a close up view of the aircraft`s outstanding characteristics, comfort, and performance, that benefit both operators and passengers alike. airBaltic’s A220-300 features a comfortable cabin arrangement able to accommodate 145 passengers in true widebody comfort. The Latvian airline already operates 13 A220-300s out of a total of 50 ordered. The A220 is the only aircraft purpose built for the 100-150 seat market, it delivers unbeatable fuel efficiency and true widebody comfort in a single aisle aircraft. The A220 brings together state-of-the-art aerodynamics, advanced materials and Pratt & Whitney’s latest-generation PW1500G geared turbofan engines to offer at least 20 percent lower fuel burn per seat compared to previous generation aircraft. With a range of up to 3,200 nm (5020 km), the A220 offers the performance of larger single aisle aircraft.With an order book of over 400 aircraft to date, the A220 has all the credentials to win the lion’s share of the 100- to 150-seat aircraft market. The A220-300 will first attend the Zhuhai airshow (China) from November 5th until November 8th before flying to Chengdu on November 9th. The aircraft will continue on its journey with a stopover in Koh Samui (Thailand) on November 10th before flying to Kathmandu (Nepal) on November 11th. After that the airBaltic A220 will go to Istanbul (Turkey) on November 12thbefore returning to its home base in Riga (Latvia) on November 14th. The group forecasts an annual increase in global traffic growth over the next 20 year-end to double emplacements (8.2 Billion) by 2037. Interestingly (and expectantly), China will become the world’s greatest aviation market (to, from, within) the country supposedly by mid – 2020’s. Look for India to become third! It looks like Iceland Air just bought out Wow Air and they will still operate separately out of the Icelandic aviation market. With less than 4% of the transatlantic market, both airlines have “challenging” profit issues and this may be a start to reduce that stress. While Wow had been working on a public offering before this announcement, the airlines appear to have seen value in the joining before that event occurrence. The naming of the final organization might be interesting. Survey reveals younger travellers want virtual reality tours, AR board games, high tech viewing and booking for tourist attractions, VR boxing matches, hologram clothes shopping and robotic medical help – before they even get on the plane. Older travellers are not so keen. 17% of 18-24-year-olds would like to try on hologram clothes at an airport, while only 6% of 55 and overs would. Similarly, a second GB survey**, which asked respondents to envisage an upcoming long haul flight from London to New York showed that 38% wanted artificial intelligence to help with speeding up the airport process and 35% wanted it to give information on news in their destination whilst on-board the flight. A YouGov survey* regarding choices for the airport lounge showed a sharp difference in both ages and regions – given the option of taking a virtual reality ‘Great Wall of China’ experience in an airport lounge where the passenger would walk on a treadmill and in real-time experience the sights of the Great Wall of China – people from Wales were the most enthusiastic, with 31% saying that they would, while people from the North East of England were the least enthusiastic (16%). Passengers from the South East were most likely to choose to test-drive the latest luxury sports cars using virtual reality headsets and sitting in real car seats at an airport (25%), while people in the North East were less enthusiastic at 16%. Eleven per cent of people in the South West would like a VR experience that recreated their own sitting rooms in the airport lounge, the highest in the UK. People in the South West (45%) were most likely to want technology to help them speed up the journey through the airport. People in the South East (42%) and Scotland (39%) were the most likely to want AI to give them information on the latest news in the area they were going to. A recent survey* proved that retired passengers were possibly the most relaxed passengers, with only 2% of them saying they’d like to take part in a virtual reality boxing match to let off steam before the flight, while 17% of full-time students chose this option. When comparing the working status of these groups, we can see that a full 44% of full-time studentssaid that they would choose to do the full China Wall experience while only 23% of retired peoplewould. Nearly a half (48%) of retired people did not want any sort of personalized experience at an airport compared with a quarter (25%) of full time students. Twenty-seven per cent of all respondents would not like artificial intelligence to assist them with anything for their trip with over 55s most resistant to AI in airports at 33% saying they would not like it to assist them, while only 17% of 18-24-year-olds didn’t want help from AI. Students were most likely to want to use AI to teach them a new language or skill with 38% choosing this option. One survey* suggested that women seem to be keener on a real-world sensory experience, involving direct human interaction – for the question “You will be served an array of small luxury handmade chocolates and a pink cider. The staff serving you will explain how each is made” it was a thumbs up from 21% of men while 30% of women chose the option. Twenty-seven per cent of men would test drive a new luxury car in VR, while only 17% of women would. A second survey**, about a potential future London to New York trip, similarly proved that women were significantly more likely at 33% to want a personalized guide to their destination than men (25%). Menwere more likely to want to AI to teach them a new skill or language (21%) than women (16%). People in the East of England (14%) and full-time students (18%) are most likely to welcome on-board medical help driven by artificial intelligence, while those in the North East (4%) are less keen. “We commissioned this research to find out what the British public actually wants out of their airport and airport lounge experiences. Airport lounges in particular are evolving from faceless waiting rooms with chairs and a coffee machine to being providers of an experience in their own right. The results send a clear message to us that people want the introduction of technology, but only in a way that enhances their trip, entertains or is enjoyable. After a successful tendering process launched in December 2016, Vision-Box is now ready to unleash one more world-premiere: a ground-breaking Automated Border Control solution will be delivered, further securing the country’s borders and providing a seamless biometric-driven experience to arriving passengers. Canberra, Australia | July 27, 2017–Vision-Box has today entered into a contract with the Australian Government to deliver the world’s first automated ‘contactless’ traveller clearance processes for people arriving in Australia by air at all international airports. This contract was celebrated in the scope of the Seamless Traveller program and will expand Vision-Box’s successful presence in Australia initially sustained by its important work on the project that began in 2015 after the Australian Government selected the company to provide biometric border control SmartGates at all Airports’ departures. 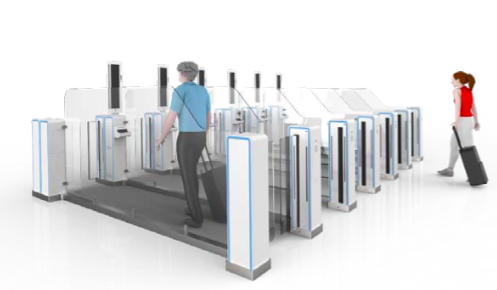 This three-year contract will deliver the next generation of Automated Border Control passenger-processing technology. Vision Box’s latest innovations will assist the Australian Department of Immigration and Border Protection to collect and verify biometric data from all passengers arriving at Australian International Airports. It will also deliver a new capability that will enable known travellers to self-process through the border without the need to physically use a passport (contactless), entirely relying on facial recognition technology. Berkshire, UK | September 20, 2016– The typical premium longhaul passenger is highly engaged with current events and uses print media alongside other channels to stay informed at the airport and inflight. That’s the headline finding of an authoritative new study of media consumption among US travellers, commissioned by Dawson Media Direct. The survey also turned up a stat some industry watchers might find surprising: that the so-called Digital Generation is marginally more engaged than its elders, with “staying informed” cited as more important to travellers in the 21 to 39 range than to those aged 40-plus. ‘Gen D’ is a more avid consumer of conventional print media too, despite owning multiple devices, and considers paper publications the best resource for reading longer in-depth content. The study targeted passengers aged 21-70 who in the last 6 months had taken at least three fully paid premium-cabin round-trips between the US and Africa, Asia- Pacific, Europe, India, Middle East or South America. About 400 surveys were completed and analysed, revealing that print media becomes tangibly more important to this audience on a longhaul trip than otherwise. 77% of premium passengers view flight time as a key time to read the press, and 54% of them read some print media at the airport or onboard. Premium fliers also tend to read more printed press during air travel, with the number spending over an hour a day reading newspapers increasing by a third compared to everyday behaviour. 38% of them rank reading a printed newspaper or magazine among their top three activities under surveyed conditions, placing it ahead of digital news content, print or digital books. “The study throws up so many positives for us as a provider of both print and digital publications to the industry, says Browand. Los Angeles, CA | July 27, 2016– Global Eagle Entertainment Inc. (NASDAQ: ENT) (“GEE”) today announced that it has completed its previously announced acquisition of Emerging Markets Communications (“EMC”), a leading communications services provider to maritime and hard-to- reach land markets. The combination of GEE and EMC creates one of the world’s largest providers of satellite-based connectivity and media to the rapidly growing global mobility market. GEE has established a strong track record of successfully delivering media content and connectivity to airlines, while EMC has become a top provider of connectivity to maritime and hard-to-reach land markets. When combined with EMC, GEE benefits from significant economies of scale and an enhanced global infrastructure that enables it to deliver a comprehensive portfolio of products to customers. Engineering, technical and managerial resources to effectively drive new product development, program management, product maintenance, and field support. GEE has a successful track record of integrating acquisitions and achieving synergies. With EMC, the Company expects to realize synergies of $15 million in 2017, growing to $40 million in 2018 and thereafter. A major source of savings is expected to come from network efficiencies, including the ability to optimize bandwidth costs through a consolidation of existing network assets, including space segment and ground infrastructure, as well as better capacity utilization. Savings are also expected through reductions in SG&A spending and the consolidation of facilities. In addition to cost savings, GEE expects the combination to generate significant revenue synergies. Driving sales of GEE’s media, software, advertising and operations solutions products in the underserved maritime market are a key objective of the Company. GEE’s digital media team has had a long-term relationship with EMC and expects to launch new products to major cruise lines before year-end. EMC’s proprietary technologies are in use today to improve the connectivity experience and optimize bandwidth usage in the maritime market. GEE will soon introduce these technologies into the aviation market. Dave Davis will continue to lead GEE as CEO. Abel Avellan, founder and CEO of EMC, will serve as President and Chief Strategy Officer of GEE. As part of the transaction, ABRY Partners, EMC’s largest shareholder, has a right to nominate a director to GEE’s board. In conjunction with the transaction close, GEE has established three operational business units. The Media Business Unit delivers films and television shows, live TV, music, games and other content to aviation and maritime customers, including approximately 6,500 aircraft and many cruise ships currently served by GEE. Other products include digital and streaming media offerings such as the Airtime Content-to-Go application and the Entice streaming media system. Wale Adepoju will lead the Media Business Unit as Executive Vice President of Media. Previously, Wale served as Chief Commercial Officer of GEE. The Aviation Business Unit serves commercial airlines and private aviation using GEE’s proprietary Airconnect GlobalTM connectivity platform, which is currently installed on nearly 750 aircraft worldwide. The Business Unit also provides Navaero electronic flight bag (EFB) data interfaces and powered mounting systems, which are in place on nearly 4,000 aircraft today, as well as Masflight operational data analytics services. Joshua Marks, who previously led GEE’s Operations Solutions team, will lead the Aviation Business Unit as Executive Vice President of Aviation. The Maritime and Land Business Unit delivers connectivity and mission critical services to cruise and ferry lines, yachts, commercial shippers and land-based users such as non- governmental organizations and mobile network operators. Through this transaction, GEE has acquired a strong maritime customer base, serving over 1,500 vessels and 100,000 cruise ship cabins. In addition to overseeing certain corporate functions at GEE, Abel Avellan will lead the Maritime and Land Business Unit. Beijing, China | July 27, 2016– Airline passengers in China are heavy users of technology both in their everyday lives and throughout their travel journeys. Nearly one quarter perceive themselves as ‘hyper-connected’ – they value efficiency and use self-service technology more frequently. Airlines are meeting their needs with 80% adopting connected aircraft and 100% investing in mobile-based services and the Internet of Things. In the 2016 SITA Passenger IT Trends Survey, conducted across China and representing almost 60% of the country’s passenger traffic, IT provider SITA analyzed the behavior of four different types of passengers. The Careful Planner, Pampered, Hyper-Connected and Open-Minded Adventurer profiles each uses technology in different ways. China has the highest proportion of ‘hyper-connected’ passengers worldwide with 24% compared to the global average of 14%. These passengers tend to use technology, such as mobile devices to book, check-in and manage their trip, more frequently than the other profiles. Airline passengers across the globe are so comfortable with technology today that they are choosing to use it rather than interacting with people. This is particularly evident in China where SITA reports 98% of passengers carry at least one mobile device and 49% carry a tablet. They also score very highly on an index of online and mobile service usage in their everyday lives at 7.1 out of 10 and increasingly are using mobile services for travel. Today nearly 17% of these passengers check-in using a mobile app and airlines are predicting a jump in adoption over the next three years. Having the ability to make the passenger experience a fully-connected one with connectivity on the ground and in the air is vital. Today Chinese airlines are leading the adoption of connected aircraft because of their comparatively modern fleets. In fact, 80% of Chinese airlines already fly, or are just taking delivery of connected aircraft versus a 45% global average. SITA’s survey shows that 40% of Chinese airlines believe that the key benefit of connected aircraft will be improving the passenger experience and 100% plan to invest in wireless in-flight services for passengers over the next three years. Already in China 58% of passengers use their mobile devices onboard for in-flight entertainment. The ‘Internet of Things’ (IoT) is also high on the agenda of airlines in China with 100% planning to invest in IoT over the next three years and 78% are planning major programs. Currently the only IoT initiative already implemented at Chinese airlines is fuel/engine monitoring and this by just 10% of airlines. The main areas of focus over the next three years are smart bag tags, asset tracking and monitoring the aircraft cabin environment. Baghdad, Iraq | July 4, 2016– With the help of global aviation IT provider SITA, Iraqi Airways has opened its new reservation contact center in Amman, allowing the airline to better manage its reservations across 13 countries. The center will be operated by SITA. As the airline continues to rebuild its international business, it requires reliable infrastructure that allows it to manage it reservations globally and at home from a single reservation center. It also needs to accommodate a growing demand from passengers for multi-channel support, including voice, email and chat. Leveraging SITA’s Unified Communications portfolio has allowed the airline to consolidate voice, data and audio into one platform while the cloud-based infrastructure delivers secure, reliable connectivity which effectively links the airline to its far-flung destinations. With SITA’s global presence in more than 200 countries and territories as well as more than 1,000 airports, it was possible to connect all 13 destinations seamlessly to the central reservations center. Having SITA’s Horizon® Passenger Management & Distribution system already in place, Iraqi Airways was also able to integrate the new center with the airline’s reservation, ticketing, e-commerce, inventory and departure control systems. Using a new-generation graphical interface, agents are quickly and speedily able to make or change bookings. As part of the management agreement, SITA recruited all agents and trained them to use the various elements of the passenger services system. The reservation center will be manned by agents who are able to assist passengers in English, Arabic and Kurdish.